Shadows of Brimstone has arrived! Following the end of the kickstarter back in November 2013, it’s been a long and boring wait for my pledges to be fulfilled. But now, they have, and I have to say: I’m really overwhelmed! 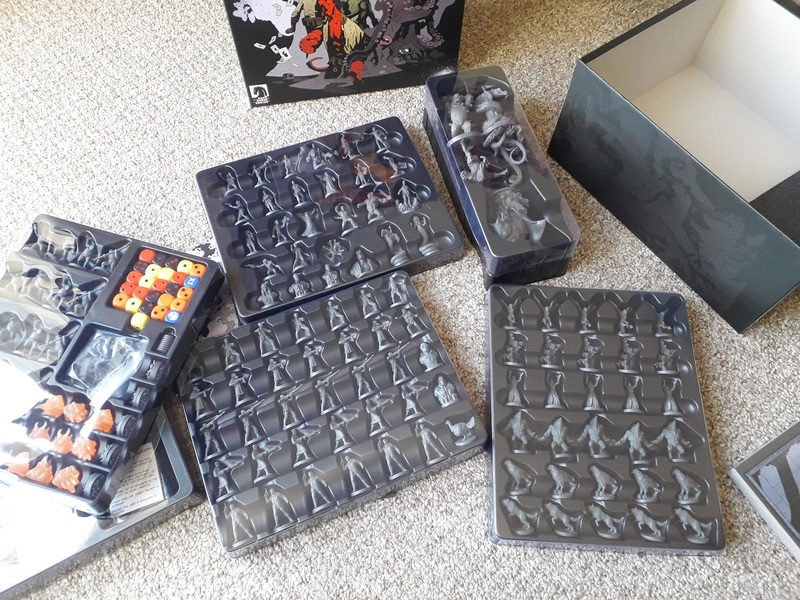 I’ve had a peculiar relationship with this game, going from overwhelming enthusiasm for it during the kickstarter campaign, to severe disappointment when the core sets were delivered. I’ve played it a couple of times, and I can’t work out if I actually enjoy it or not, so it has spent a very long time on the shelf. I believe I’ve now had everything delivered, though I’m not entirely sure about a couple of things I had added in the pledge manager, so need to try and go through it all again. Some things I’ve decided to sell off, as I have pretty much everything twice, so I’ve been separating off a few bits that are easy enough to do this with, but even so – wow! It’s a bit silly, really, to want to play with some of the new stuff so soon. I have barely scratched the surface of the core sets, so I’m hardly about to start throwing something like the Ancient One into the mix! I’ve played the game a total of 8 times, according to my stats on boardgamegeek, though the last time I played was in June 2015. I think it might be interesting to do something like build up some Targa stuff, then return to Cities of Death and introduce some of the new stuff that way. Maybe. At any rate, I’m hoping to start going through this stuff soon enough, and will eventually get the long-talked-about game day blog on it! Stay tuned folks!! Author spalanzPosted on January 18, 2018 Categories board gamesTags board games, Flying Frog Productions, kickstarter, Shadows of Brimstone2 Comments on Shadows of Brimstone has arrived! Last week, I read this really insightful article on the place of Kickstarter games in today’s gaming culture, and was inspired to take a look at my own experiences and opinions on the pre-order system for today’s game day blog. (Additionally, I’ve bought games like Thunderbirds and Xenoshyft: Onslaught after the kickstarter backing period, though both of these games have since been sold on). I’ve talked about quite a few of these games on my blog over the years, as it happens, and I’m still intending to feature Shadows of Brimstone at some point in the not-too-distant future (maybe when I eventually get everything that I paid for…) Looking at this list, however, after reading the article from The Opinionated Gamers, has made me think about my history with Kickstarter in general, from the heady days of 2013 when I was chomping at the bit for games like Fallen and Shadows of Brimstone. In particular, it’s made me consider how I feel about the system these days. So I actually used Kickstarter originally to support Christopher West, who made a lot of the maps for the Star Wars Miniatures game. I think I bought four of his map packs in total, and they were really nice, solid products that I was happy to include within my game collection. At the time, I wasn’t playing a massive amount of board games, having recently split up from my ex (who had initially introduced me to tabletop games like Carcassonne). I bought the maps, used them a couple of times, then slowly moved away from SWM anyway. Then, somehow, I discovered Slugfest Games were making a fourth Red Dragon Inn game via Kickstarter, and so returned to the site to check it out. I think I managed to get in at the very end of the campaign, but still got all of the nice exclusive drinks and stuff. Score one for me! 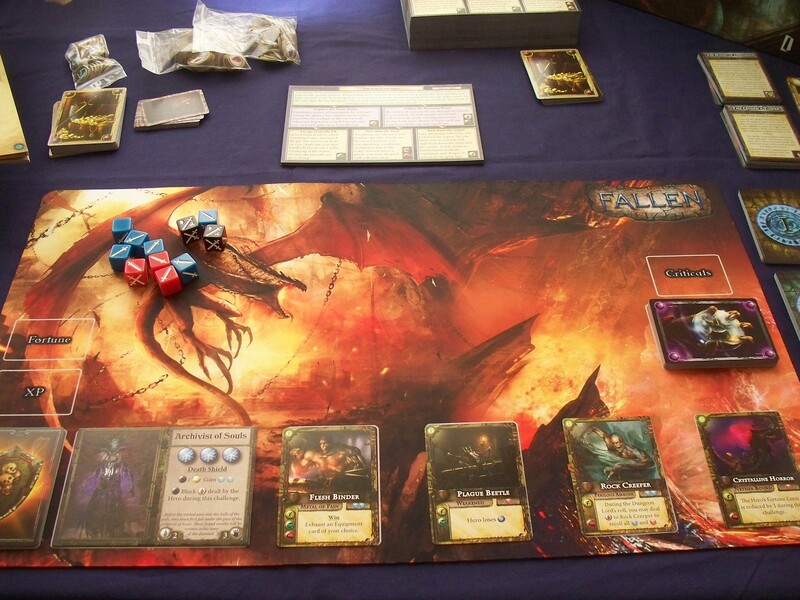 It was RDI4 that seemed to set me off the rails, though, as I would browse KS for other tabletop games similar to those old stalwarts of my collection such as Runebound, and it was with no small measure of excitement that I discovered Fallen. There are a lot of issues with the company here, which I won’t get into now, but Fallen itself is actually a really good game. It has beautiful art, and plays fairly straightforwardly, though is really quite the immersive experience. Definitely a good card game. Over the months, I backed a series of other, progressively bigger games, including the behemoth that is Shadows of Brimstone. I’ve talked about this game extensively on my blog already, though still haven’t managed to do an actual game day blog on it. At any rate, you may already know that I dropped thousands of dollars on the game (I’m actually in it!) and yet, once the core games were delivered, I was distinctly underwhelmed. 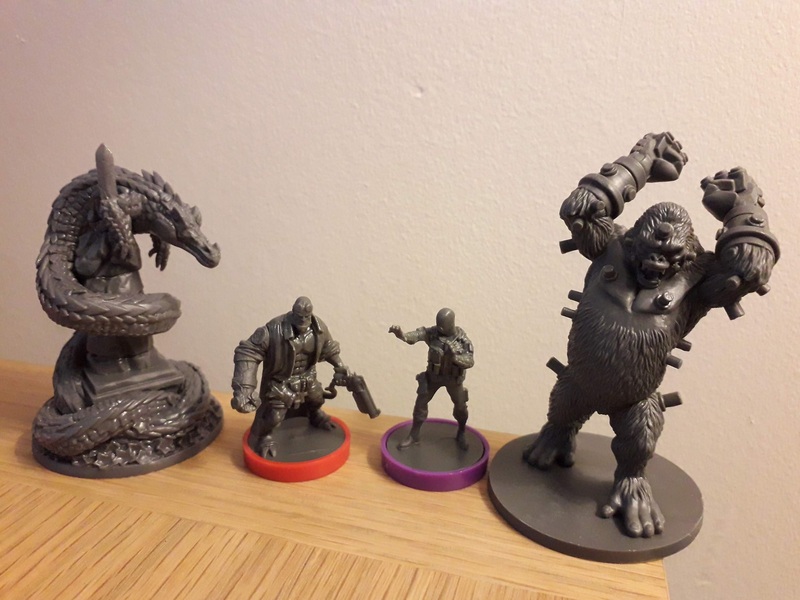 With the arrival of games like Blood Rage and Journey, I began to re-evaluate my relationship with Kickstarter and, while both these games have incredibly impressive miniatures, I found that there was a distinct lack of something to these games. The Opinionated Gamers talk about “the chrome” of these games, and the allure of the shiny, and I think this is a very valid point in this situation. A lot of successful games on Kickstarter have a lot of shiny parts. 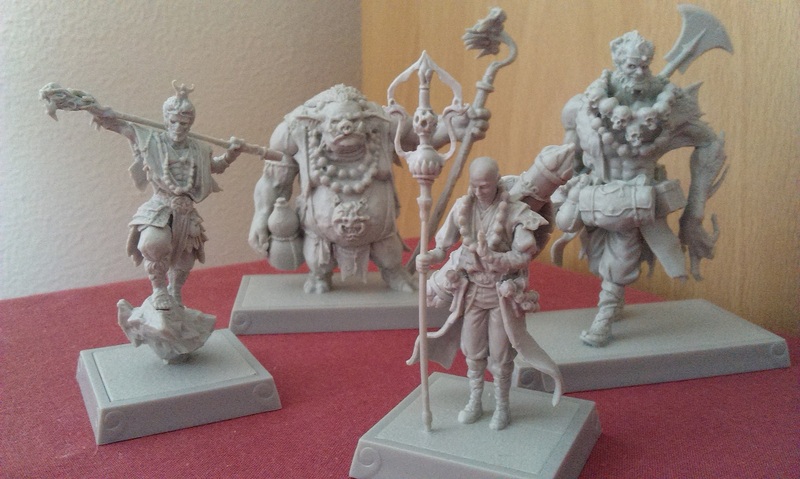 Be it the glossy fantasy art that graces the cards of Fallen, or the intricately sculpted miniatures in Journey, these games have gone all-in on their style. But how is the substance? Is it even there? Shadows of Brimstone uses a fairly simple game engine that Flying Frog Productions have used in pretty much all of their previous games, yet it has elements added on to make it slightly cumbersome. This is a bit of an exception, because by and large you know what you’re getting from FFP. Other games do feel a little bit hit and miss, and I think this could well be due to the home grown nature of Kickstarter games. Take Journey: Wrath of Demons, for example. This is a co-op game where players have the option during combat of cleansing the soul of their demon opponent. It sounds like a really neat concept, and from what I remember of the couple of games I’ve played, it was quite interesting, but otherwise the game is the standard dungeon-crawl-style of game with an Oriental setting. Xenoshyft: Onslaught is a deck-building game where you buy cards and they go directly into your hand; otherwise, the game plays pretty much like Thunderstone. 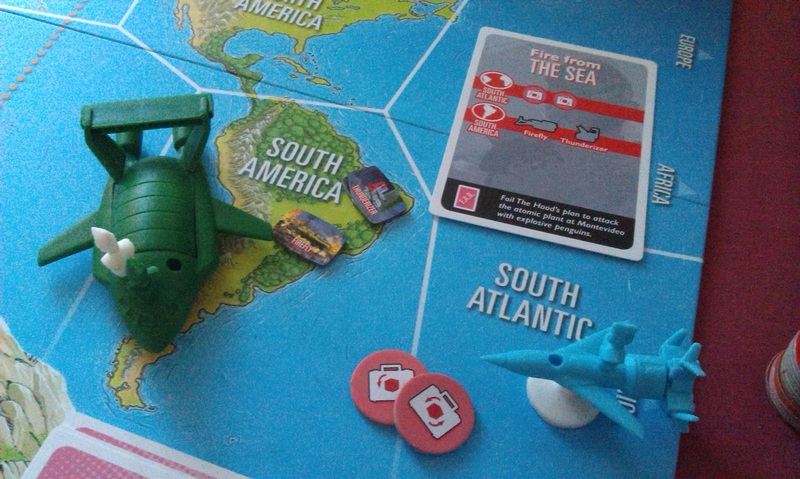 These games feel a bit like the designers came up with a cool idea during a game of something else, and decided to implement it on their own. There’s nothing wrong with that, of course, but it does often feel like, once you’re past that shiny new mechanic, there isn’t really a great deal of substance underneath the game – certainly not enough to compete with those games from established publishers. The Opinionated Gamers article also mentions playtesting as being more rigorous with established companies, though many Kickstarter games have the promise of “years of development and testing” and the like, and not just those from companies like FFP or CMoN. Being an optimist, I’m inclined to believe them, and I don’t think I’ve yet played a game that doesn’t feel playtested. Of course, new companies using Kickstarter are – in my experience – more concerned with showing off their beautiful components for their games, and I think this is the major problem with a lot of these games, that they’re all about style over substance. Journey does look beautiful, down to its anatomically-correct bull miniatures, but the gameplay hasn’t been good enough to draw me into playing it any more since September 2015. I haven’t touched Shadows of Brimstone in two years, save to move the box into my closet. Once I’ve seen all of the shiny new stuff, I’m actually quite apathetic towards these games – largely because there isn’t much actual game there. 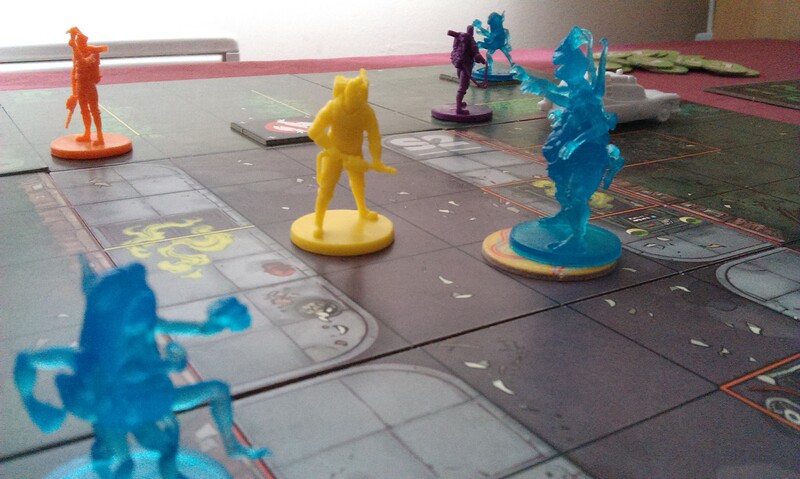 Cryptozoic’s Ghostbusters game was actually pretty decent, with some flavourful mechanics that did actually engage me enough to play a campaign with it, and while I’ve hardly been playing it every weekend, that’s probably more to a shift in my gaming life recently towards fewer large-scale games. 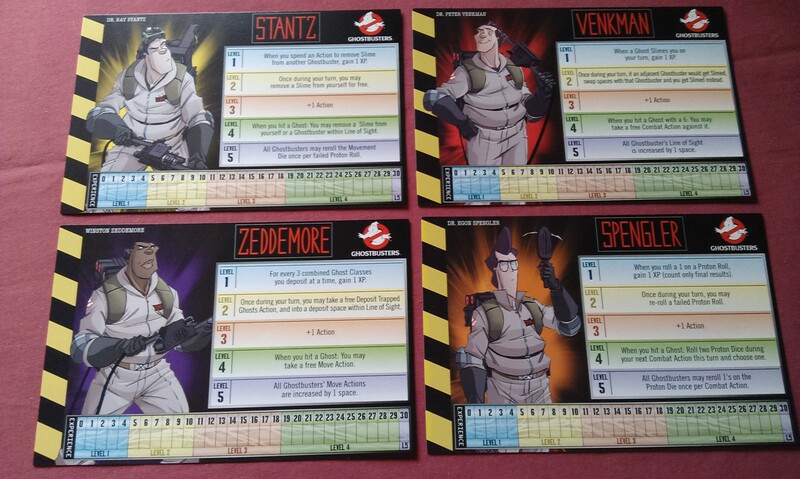 Of all of the Kickstarter games that I have, Ghostbusters is probably the only one I find myself wanting to play more of. Though I freely admit that’s probably as much down to my nostalgia for the franchise. These days, I avoid Kickstarter like the plague. 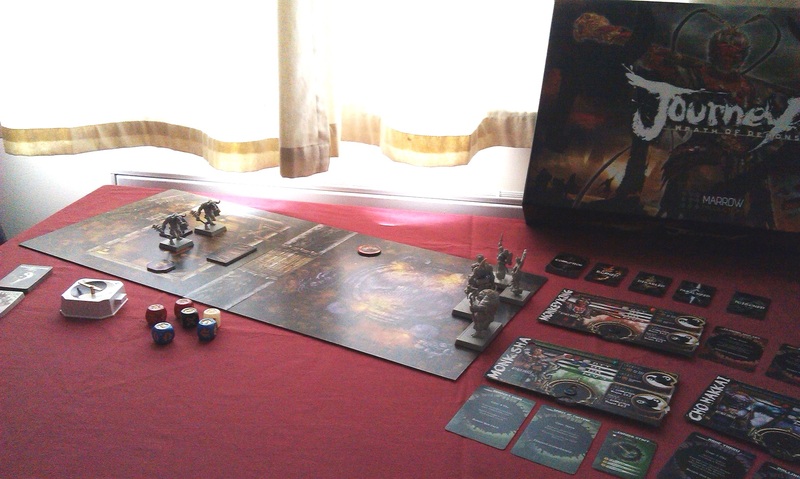 I usually blame my burnout on Shadows of Brimstone, the game that I spent over $2300 on, as the parts that I have so far received, three and a half years after the campaign ended, were distinctly sub-standard. 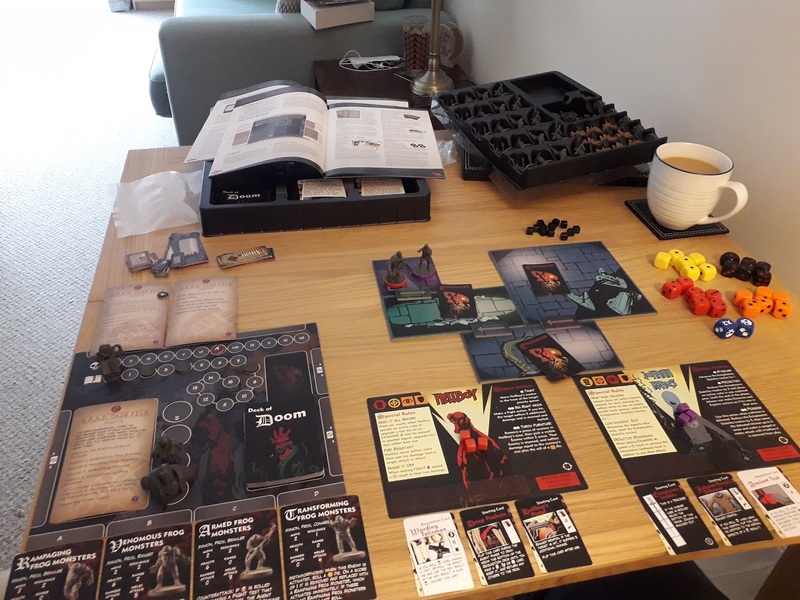 Tony, my regular gaming buddy and the chap who often encouraged my Kickstarter excesses, has completely embraced it and, together with his partner Lee, has backed dozens of projects in recent years. All of these games tend to be miniatures-heavy, though all of them tend to be consigned to the bottom of his pile of games, in favour of stuff like Last Night on Earth and Lords of Waterdeep. This seems to be the problem with KS games for me. They look amazing, but looks aren’t everything, and I doubt anybody would want to play a dull-as-hell game just because it looks so pretty. 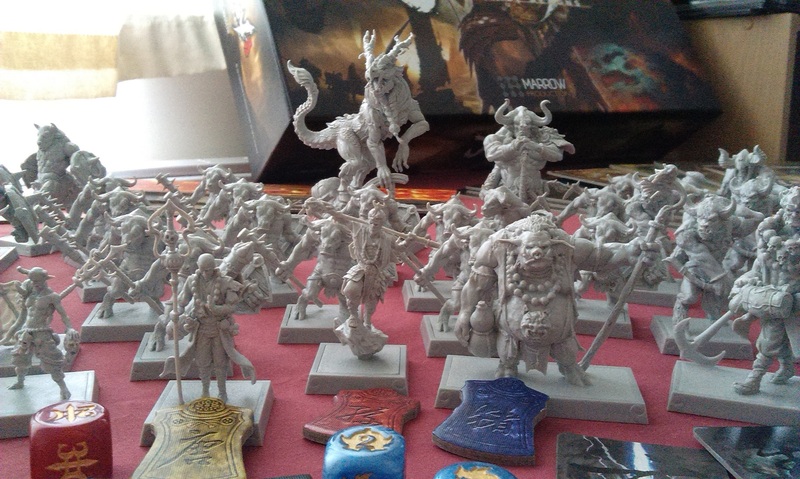 There needs to be more than just awesome models to keep you wanting to play it, and even if you feel you need to keep playing it to get your money’s worth (like me and Shadows of Brimstone, for a while!) it’s eventually going to wear on you. At the top of this post, I mentioned that I previously owned 4 games that I had backed via Kickstarter, and have bought more at retail that I’ve since sold on as well. In addition to this, I’m actually considering off-loading Journey, though I’ll admit that I want to try it again before I do. I think this attitude towards these games does say a lot for my current view, at any rate. There just isn’t enough substance to a lot of these things to make me want to keep them, despite the amount of money I spent in backing them. Author spalanzPosted on May 30, 2017 May 28, 2017 Categories board gamesTags board games, game day, kickstarter, thoughts3 Comments on Kickstarter Burnout? It’s birthday week again at spalanz.com, as my blog turns two on Thursday – aww! To celebrate, I’m having another theme-week, though not quite as expansive as last year’s Indiana Jones week unfortunately. But it’s still amazing, as we once again return to a beloved franchise from the 1980s – it’s Ghostbusters! 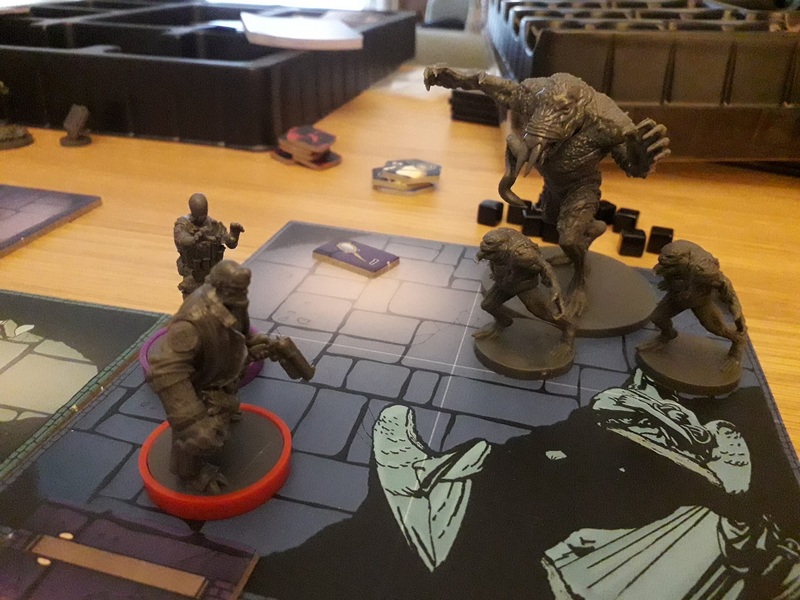 I’ve got a couple of blogs coming later in the week that will be waxing lyrical on the movies and such, so you can definitely look forward to those, but it’s Tuesday, so it’s time for a game day blog – and one that I’ve been really looking forward to sharing with you guys: it’s the new board game from Cryptozoic! 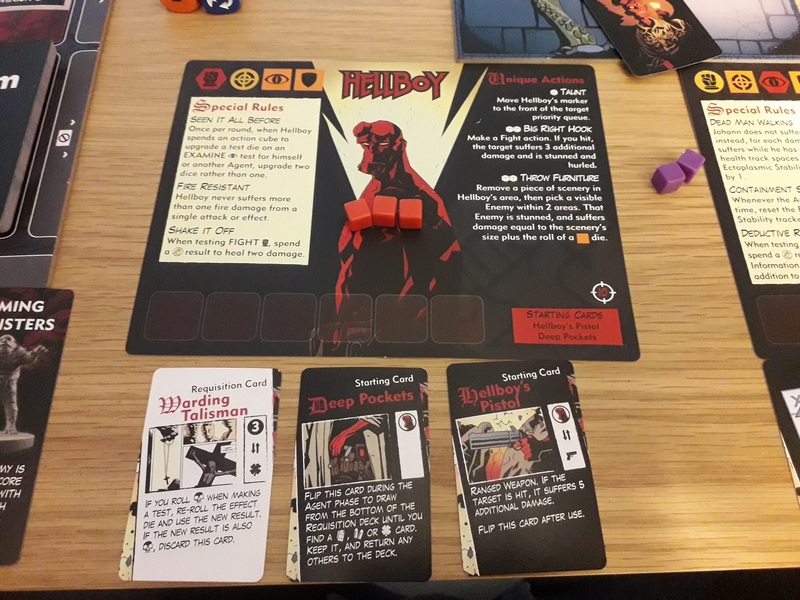 During the game, you get the opportunity to level up your character by busting ghosts, which gives your character additional skills – it’s a simplified RPG-style system, and one that I am pretty impressed by! Ghosts come in different classes, which roughly denotes how difficult they are to deal with, and feature the mechanics used to both move and trap them (more on this shortly). The ghost miniatures are all this clear-blue plastic, with the exception of Stay Puft Marshmallow Man (white, obviously) and Slimer (in green). Something I think is really cool is that whenever a ghost moves into another ghost, they become a bigger threat, turning into a ghost of the next class up! Wonderful! 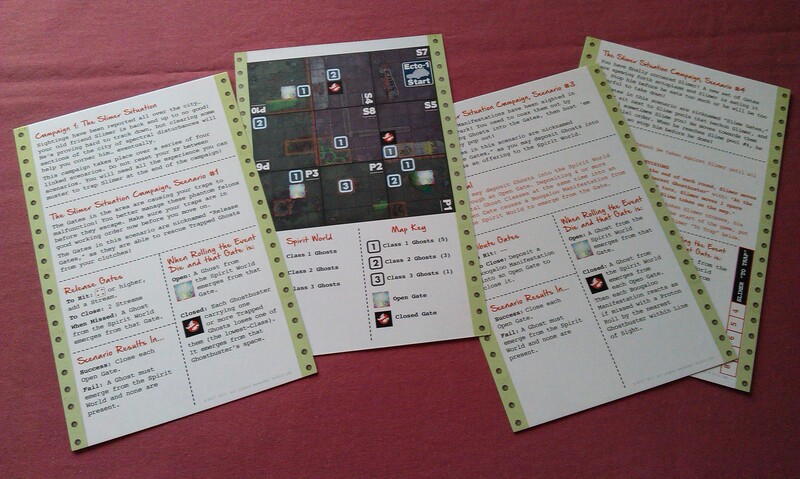 These cards show how to set up the map tiles, where to place ghost miniatures, etc, and feature the win conditions. 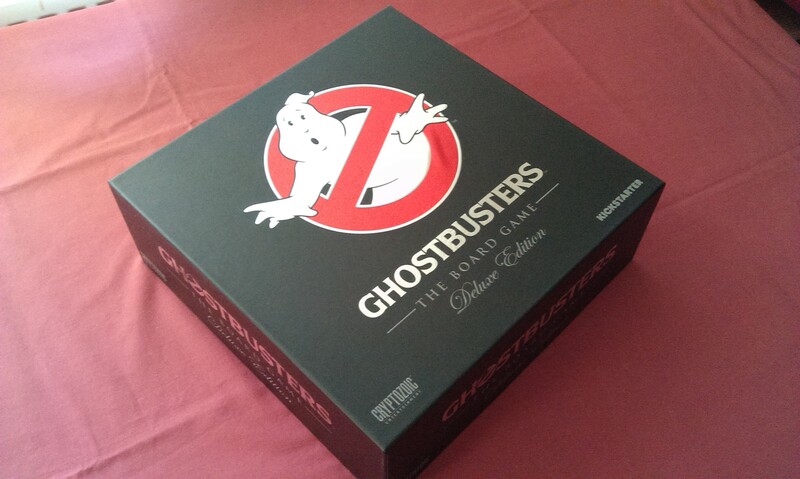 The game round is split between the Ghostbusters’ movement, any “end of round” effects, then the Event die is rolled. On a Ghostbuster’s turn, you have two actions to choose from, such as moving, aiding others, and combat. The main focus is of course combat, as you try to rid the streets of New York of all the paranormal manifestations! Importantly, to hit a ghost, you must have line of sight to it – so any terrain features outlined on the map can potentially block you. You also need to be no more than 3 spaces away from it. Each ghost has a to hit and to trap value on its card – when you’re fighting it, you roll a d6 and try to equal or exceed the hit value. If you’re successful, you’ll get to put a proton stream marker underneath that ghost (as shown above, Egon has hit the Boogaloo Manifestation once, so he gets to put one stream token under it). Class 1 ghosts only require one stream token to trap them, so if you hit them, you get to remove them from the board and place them on your character sheet; otherwise, the ghosts will continue to move around with that stream token under them until they are trapped – hit enough times to have stream tokens under them equal to their to trap value. When this happens, the Ghostbuster who put the final stream token on the ghost gets it, but anyone else who had stream tokens under the ghost gets 1XP. Ghostbusters also have some abilities to gain additional XP from their abilities. Once each Ghostbuster has had their allotted two actions, if the scenario card shows any end-of-round actions, they’ll happen, then the event die is rolled. This is a custom d6 with the Zener Card symbols (from Venkman’s test at the beginning of the movie?) 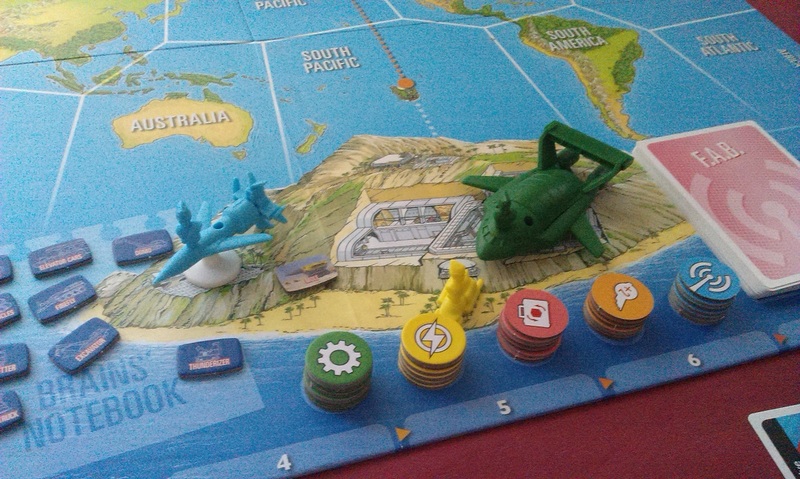 – the scenario card tells you how many gates there are open on the map, represented by cardboard tokens as seen in the above photo. These gates also have the symbols on them, and if the symbol rolled matches an open gate, a new ghost will come out of it. The way these ghosts come out is pretty nice, as well – there is another cardboard tile that represents a PKE meter, with numbers 1-8 around a central square. You roll a d8 to determine which square the ghost will emerge onto, imagining the gate tile as being the central square. The event die also has an eight-pointed Chaos star (if you’re familiar with Warhammer, you’ll know this one). This represents Chaos and each ghost on the map will move according to its reference card. This is a really fun game, I like it a lot! 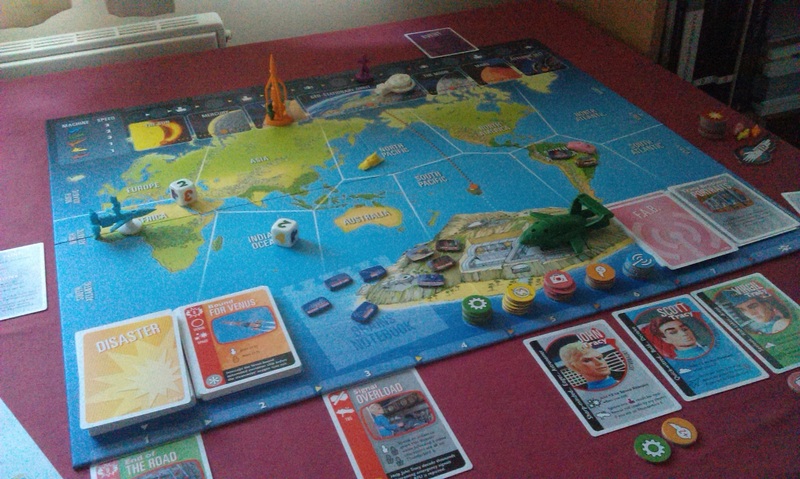 The rulebook isn’t particularly great, which made my very first game a bit confusing as I tried to make sense of what I was doing in terms of the round structure or whatever, but once I got past that, I think it went pretty smoothly and I quickly got into it – after which, I quickly discovered that I really loved it! The basic game that you can get at retail has a lot of fun, but the kickstarter version has got a whole ton of extras, and it would be remiss of me to not mention this. To be blunt, the kickstarter campaign was a bit of a mess. Almost all of the classic movie stuff was kickstarter exclusive, including the librarian, Gozer and the dogs, etc, which was something of a bizarre move from such an established game company. As of the time of this writing, there is a second game up on kickstarter, which has a lot of this kickstarter loot available in add-ons, and anyone who picked up this game at retail should definitely look into that. It’s not all of the content, unfortunately, but it’s a lot of it. The scenarios are where the game shines of course, and there are plenty of them to keep you going through so much gaming, and they are a whole ton of fun. Author spalanzPosted on April 19, 2016 March 24, 2017 Categories board gamesTags Birthday Week, board games, Cryptozoic, game day, Ghostbusters, kickstarter, nostalgiaLeave a comment on Who ya gonna call? 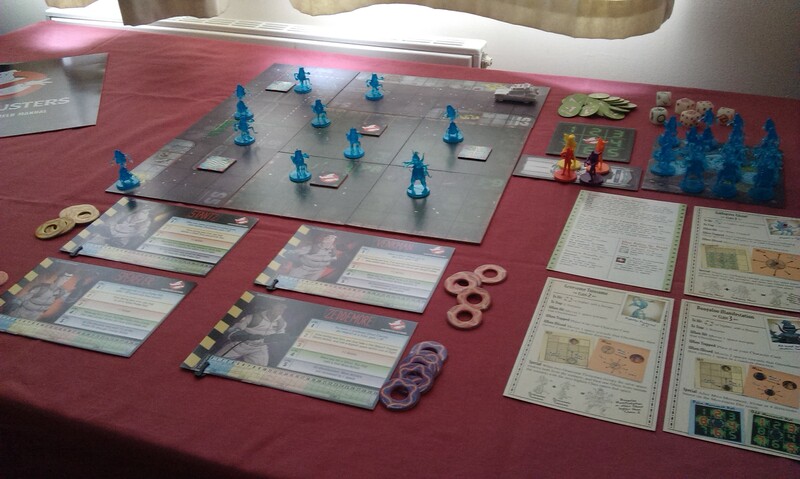 The Ghostbusters II board game has gone live on kickstarter today, and looks a lot of fun! I have a blog upcoming for the first game soon, but suffice it to say, it is great. 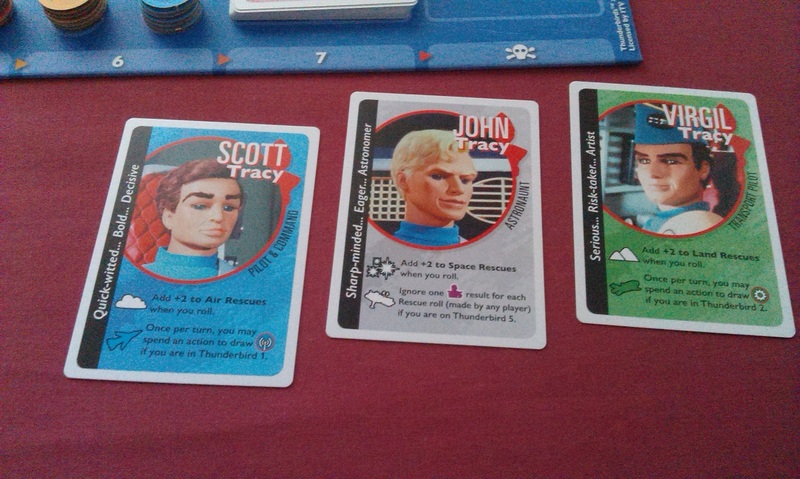 The second game looks to be just as fun – I’m particularly pleased to see Jail Jaw and Mail Fraud, two of the great ghosts from the toy line! So excited for these things!! Author spalanzPosted on April 11, 2016 Categories board games, other stuffTags board games, Cryptozoic, DC Comics, Ghostbusters, kickstarter, Suicide SquadLeave a comment on New stuff Monday! Time for another game day here at spalanz.com! I’ve been wondering if I should try to have some kind of structure to these things, so that each month sees at least one first look, one in-depth look, or whatever, but that might be too complicated for my easily-distracted mind to cope with, I’ll be honest. However, today we are indeed seeing a first look, as I delve under the lid of the newly-arrived kickstarter game, Journey: Wrath of Demons! This was originally a kickstarter game from late 2013, which my friend Tony put me onto (as is normal for kickstarter games, if I’m honest!) 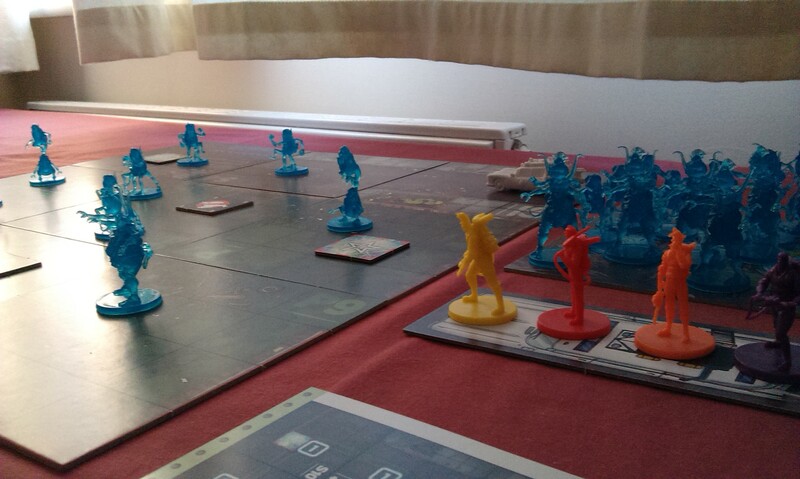 but, as I was already heavily-invested in Shadows of Brimstone at the time, I was a little sceptical. 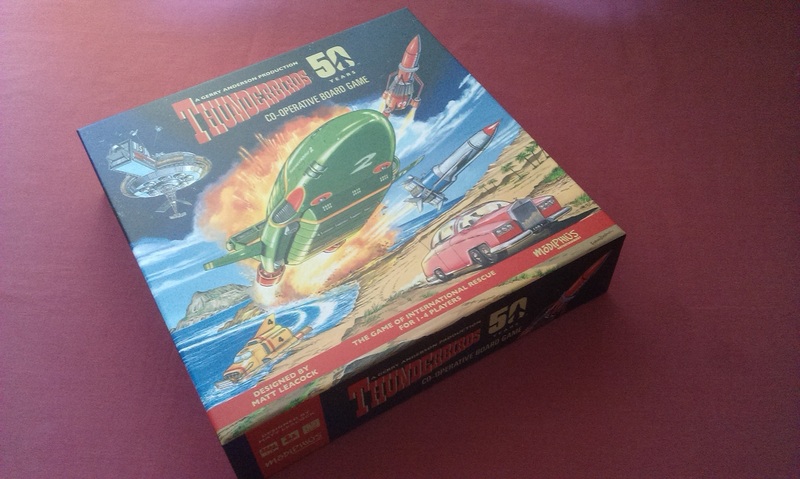 I actually went in when an early bird pledge came available – still $170, but it was the sort of all-in deal that I usually go for with these types of games. As the campaign drew to a close, I was somewhat more invested with SoB, but still decided to go for a few of the add-ons, including scenery bits and some expansion stuff. The campaign was actually pretty exciting, with a lot of additional stuff that really fired my imagination. Tony is really big into Oriental myth and legend, and while I have more than just a passing interest also, I wouldn’t say I know a lot of what I could expect in this game. My goodness, there is a lot of amazing stuff in this game, though! 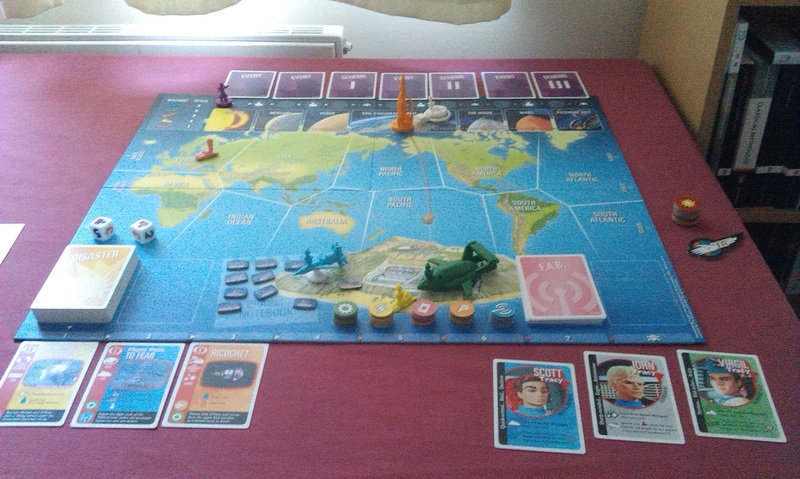 It’s a co-operative adventure for 1-4 players, which is perhaps the principal reason I was attracted to it. 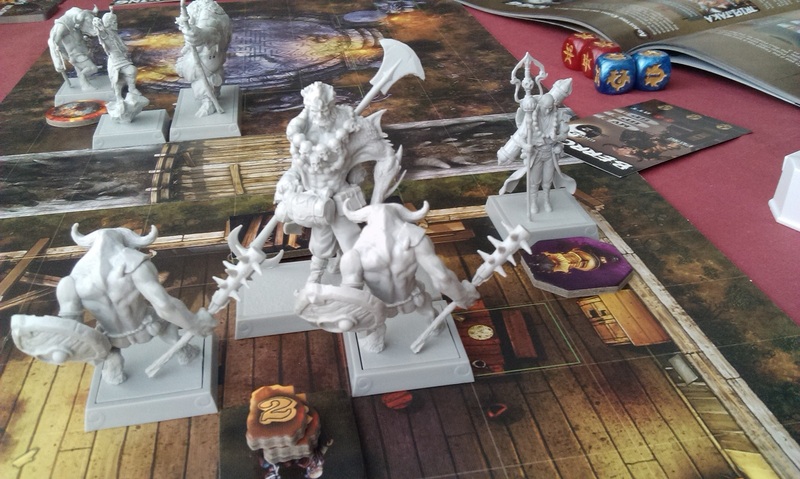 A quest-based game is always to be enjoyed of course, and with all these minis, well it was kind of a no-brainer! The campaign ended in November 2013, and it seemed to just languish in the ether until it finally started shipping a month or so ago. To some extent, I’d actually forgotten about it – definitely, my enthusiasm for the game had cooled. Of course, I had Shadows of Brimstone last Christmas, and while that was something of a let-down in quality, it still overtook pretty much anything else! 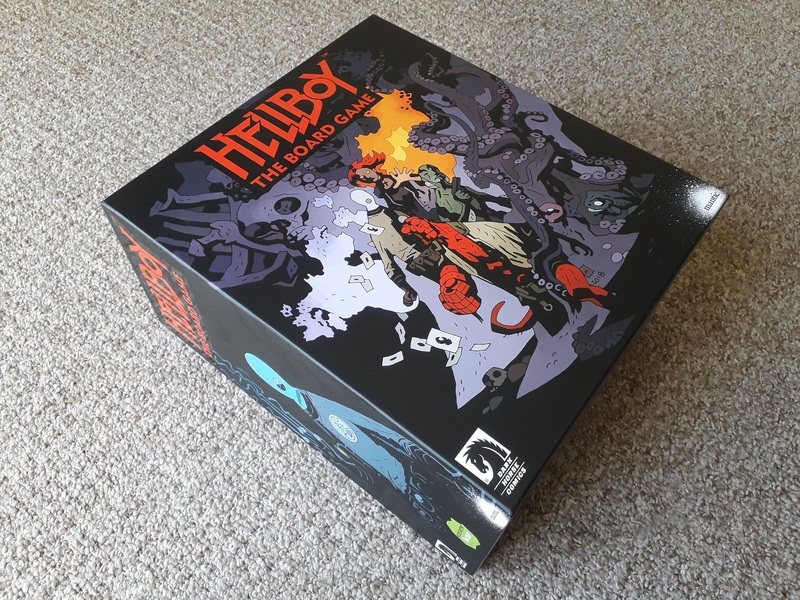 I took delivery of the game and, if I’m honest, right from opening the box I was really impressed with the production value. 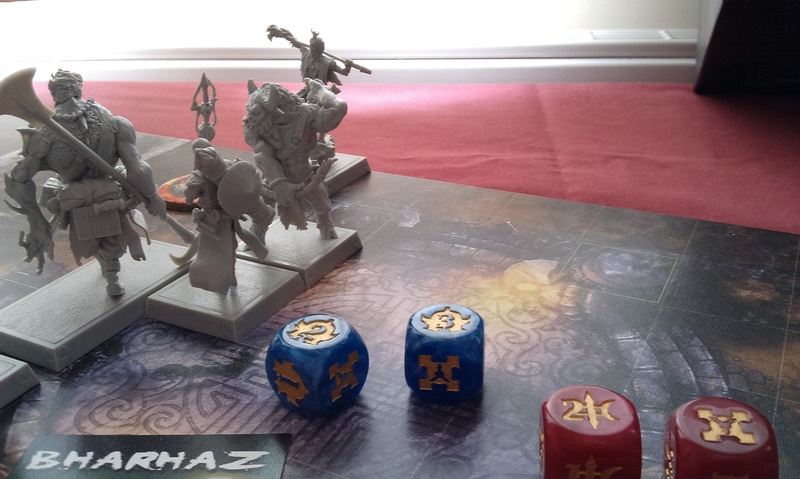 This is a miniatures-heavy game – in physical terms as well as game mechanics! 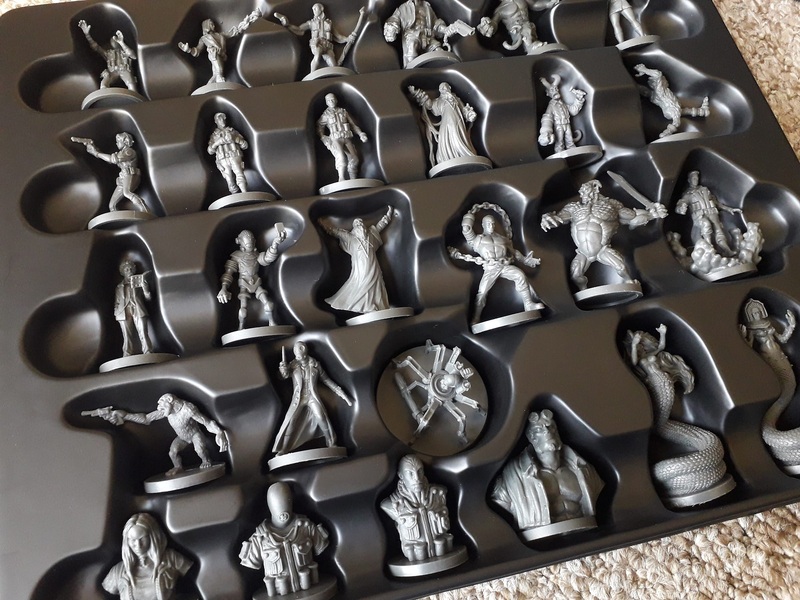 – and the storage solution is perhaps the most elegant I’ve yet seen for a game. Three boxes, in which the miniatures are stored in plastic trays. It sounds so damn straightforward, but it just looks great in the box. There are cards and tokens, but the miniatures are really where the game shines, and are what add so much to the game. As I said earlier, this is a quest-based game, with each quest having a different set-up. There are four pilgrims, characters controlled by the players, who are used in every game – if there are less than four players, someone is controlling more than one. I don’t really know enough about Chinese legend to comment on these, but the “main” pilgrim is a chap called Tripitaka, and if he dies the game ends. The pilgrims are doing something – in the above photo, I’m playing the introductory quest where the goal is to save the villagers being terrorized by the bull demons – and are opposed by the monsters, predominantly bulls of some sort in the base game, though expansions for undead and for spiders were part of the campaign, along with other random bits and pieces. Anyway! Each pilgrim has skill cards and a weapon which upgrades as you gain experience throughout your games. On your turn, you can do the usual sorts of things like move and attack, rest to recover health, and “meditate” which causes you to spin the Fortune dial and potentially gain some useful Fortune cards – the dial is a ying-yang design, and should you flick to black, you must draw a Misfortune card, which can be damaging to you. 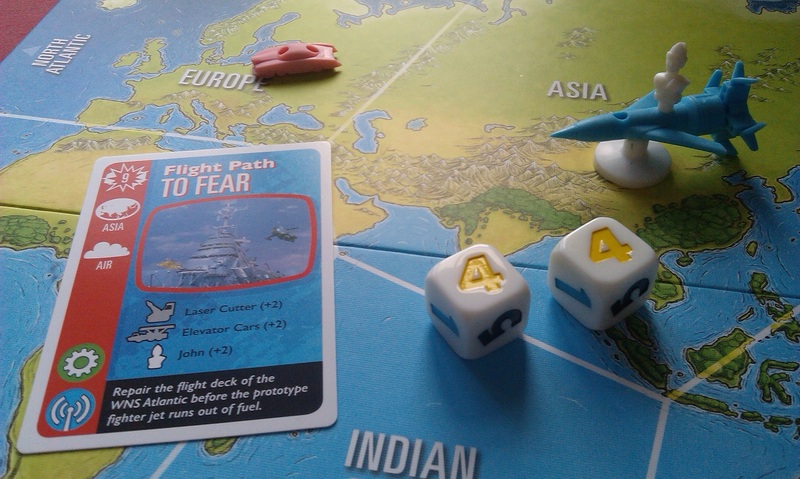 When attacking, you roll the custom dice – red dice are attack, and blue are defense. Each pilgrim rolls the same dice, but the skill cards give each something of a unique feel. In addition, you roll one, white pilgrim die, which determines how effective your weapon is. (There’s also a black die that some of the greater demons use). As you may know, I love custom dice, but these in particular feel really great. Combat is fairly exciting as you only have one chance to defeat each demon – if you don’t defeat it in one roll, then it’s staying around for later. Something that’s really interesting about this game is how the combat works. If you roll enough attack power to defeat the monster, you now have an interesting decision to make – do you merely kill the demon, or attempt to cleanse its soul? Merely killing it will give you bad kharma points, while cleansing the soul will reward you with good kharma, but it isn’t a foregone conclusion it will work. You roll the white die in an attempt to equal or exceed the demon’s soul value – if you succeed, then all is well and the demon is removed from the board; if you fail, the demon is fully healed and you’ll have to go up against him once again. I feel I need to mention the production quality of the game. The miniatures are superb, and the map tiles are really good, thick cardboard that feel really sturdy. The custom dice are also excellent. The cards, however, are much thinner than, say, CCG-style cards. The most worrying thing, to me, is the quality of the hero character sheets. 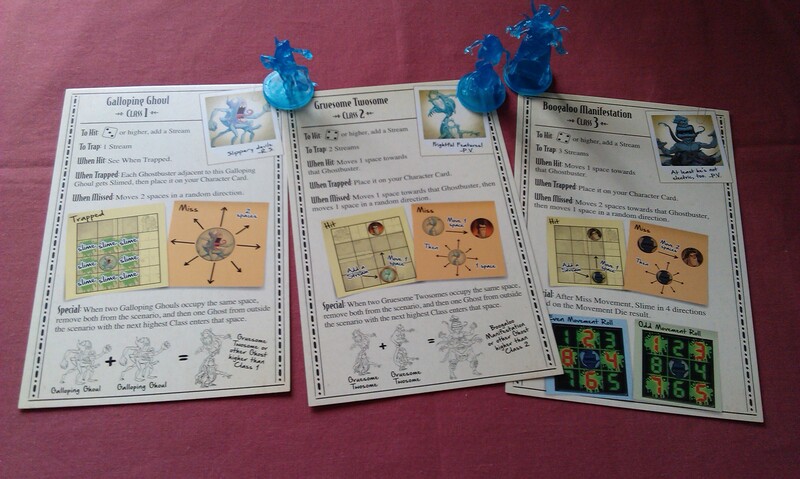 They have three wheels – much like a FFG game – but the card for the sheet itself feels too thin to support them. Furthermore, there’s a movable plastic thing that tracks your health, but it isn’t really all that secure, and overall, the hero sheet is a real disappointment. Hm. I only played the intro game last week, and it’s actually a whole lot of fun. I mean, it’s really easy, once you get the rules down, so I’m definitely looking forward to playing this a lot more and seeing more of the nuances of the game. I’ll hopefully get round to another blog, once I’ve managed to really get my teeth into this bad boy!